Bird-associated feeding by the species is often seen from the coast. Minkes are notorious for their inquisitive nature towards boats. Opportunistic tagging studies may provide essential population estimates. Typically coastal in their distribution the species often occurs close to shore. In 2000, the CRRU began a pilot study of the coastal minke whales occurring annually along the southern Moray Firth — the regular sightings of these animals providing an excellent opportunity for a behavioural and ecological investigation of these animals. Whilst much is known about these whales from the West Coast of Scotland, surprisingly no research had been carried out in this area of the North Sea at this time. 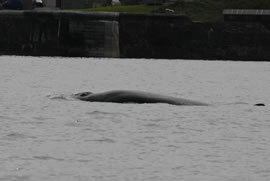 The CRRU's subsequent studies revealed an interesting distribution and fidelity of these whales along the outer southern firth coastline during the summer and early autumnal months. The determining force behind the distribution of almost all cetaceans is the distribution and abundance of target prey species, which are usually affected by a range of physical oceanographic factors, such as bathymetry, water temperature and nutrient availability, for example. These factors often vary across space and time, typically resulting in shifts in the abundance of these species to and from different areas. Through the study of this accessible population of minke whales and ascertaining which areas are most commonly selected for foraging, it then becomes possible to model and estimate possible locations for prime minke whale habitat. The range of methods currently being employed by the CRRU research team include photo-identification, behavioural studies, focal follow work and applied remote sensing techniques. 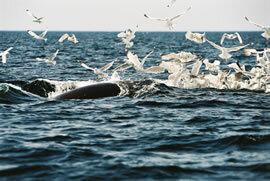 The minke whale is also a species on which much whaling interest is currently focused. With the recent resumption of commercial hunting for these animals in Icelandic waters and an overall quota of 1,286 animals for the Norwegian whaling fleet in 2010, the impacts of these activities present a considerable threat to UK minke populations. 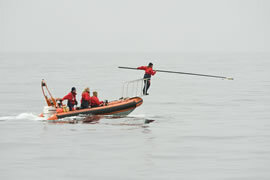 As such, the results of the CRRU's innovative research work with time-depth recorders is considered instrumental to reducing commercial whaling activities by providing more robust population estimates for the species from a better understanding of their diving ecology. The CRRU's current work with these whales is considered fundamental for the development and subsequent implementation of management plans for their protection in our UK coastal waters. For further information on the minke whale research work carried out by the CRRU team to date, check out our publications list for more details HERE. 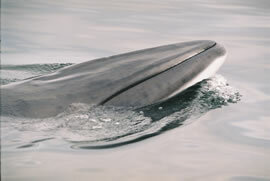 To learn more about this small rorqual whale species, visit our minke whale "fact file" page HERE.